The Jamestown Foundation’s mission is to inform and educate policy makers and the broader community about events and trends in those societies which are strategically or tactically important to the United States and which frequently restrict access to such information. Utilizing indigenous and primary sources, Jamestown’s material is delivered without political bias, filter or agenda. It is often the only source of information which should be, but is not always, available through official or intelligence channels, especially in regard to Eurasia and terrorism. 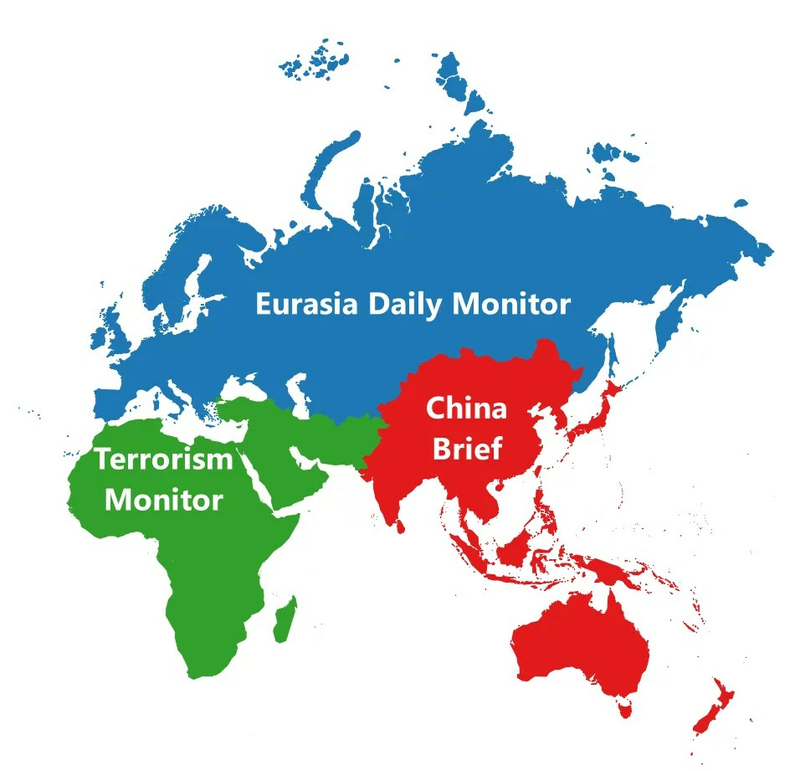 The Jamestown Foundation’s main publications are China Brief, Eurasia Daily Monitor and Terrorism Monitor. Click on the map below to explore them. Founded in 1984 by William Geimer, The Jamestown Foundation made a direct contribution to the downfall of Communism through its dissemination of information about the closed totalitarian societies of Eastern Europe and the Soviet Union. William Geimer worked with Arkady Shevchenko, the highest-ranking Soviet official ever to defect when he left his position as undersecretary general of the United Nations. Shevchenko’s memoir “Breaking With Moscow” revealed the details of Soviet superpower diplomacy, arms control strategy and tactics in the Third World, at the height of the Cold War. Through its work with Shevchenko, Jamestown rapidly became the leading source of information about the inner workings of the captive nations of the former Communist Bloc. In addition to Shevchenko, Jamestown assisted the former top Romanian intelligence officer Ion Pacepa in writing his memoirs. Jamestown ensured that both men published their insights and experience in what became bestselling books. Even today, several decades later, some credit Pacepa’s revelations about Ceausescu’s regime in his bestselling book Red Horizons with the fall of that government and the freeing of Romania. The Jamestown Foundation has emerged as a leading provider of information about Eurasia. Our research and analysis on conflict and instability in Eurasia enabled Jamestown to become one of the most reliable sources of information on the post-Soviet space, the Caucasus and Central Asia as well as China. Furthermore, since 9/11, Jamestown has utilized its network of indigenous experts in more than 50 different countries to conduct research and analysis on terrorism and the growth of al-Qaeda and al-Qaeda offshoots throughout the globe. By drawing on our ever-growing global network of experts, Jamestown has become a vital source of unfiltered, open-source information about major conflict zones around the world—from the Black Sea to Siberia, from the Persian Gulf to Latin America and the Pacific. Our core of intellectual talent includes former high-ranking government officials and military officers, political scientists, journalists, scholars and economists. Their insight contributes significantly to policymakers engaged in addressing today’s newly emerging global threats in the post 9/11 world. In 1946, an artist named Nikolai Getman was imprisoned in the Soviet Union’s GULAG, a system of forced labor camps across Siberia and the interior of the USSR. Upon his release in 1954, Getman commenced a public career as a politically correct painter. Secretly, however, for more than four decades, Getman labored at creating a visual record of the GULAG, which vividly depicts all aspects of the horrendous life (and death) so many innocent millions experienced during that infamous era. Getman’s collection is unique because it is the only visual record known to exist of this tragic phenomenon. In early 1997, The Jamestown Foundation learned of The Gulag Collection and that Getman was desperate to get the painting transported to the West; he feared that upon his death they would be destroyed. With the financial support of Jim Kimsey, The Jamestown Foundation brought the paintings to the United States, where in 1997 they were put on display in the U.S. Congress. The Collection remained with Jamestown until 2009, when it was permanently transferred to the Heritage Foundation, where it resides today (heritage.org). Ting Xu is a Senior Project Manager with the Bertelsmann Foundation in Washington, DC.